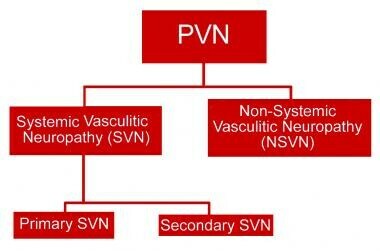 Peripheral neuropathy is common in many vasculitic syndromes and may be the only manifestation of the underlying vasculitic disease. Vasculitic neuropathy can be a part of systemic vasculitis. It also can present as a nonsystemic vasculitic neuropathy, without any constitutional symptoms or serologic abnormalities. The clinical and pathologic features are those of an ischemic neuropathy caused by a necrotizing vasculitis of small arterioles. Patients with vasculitic neuropathy may present with either mononeuritis multiplex or asymmetric sensorimotor neuropathy. Symmetric neuropathy is rare. It can present as acute/subacute relapsing, progressive, or relapsing progressive neuropathy. Asymmetric or multifocal painful sensorimotor neuropathy is the most common presentation. Asymmetry and length-independent involvement are the hallmarks of mononeuritis multiplex, which is the most common presenting feature of vasculitic neuropathy. Wallerian degeneration of nerves results from ischemic infarction caused by inflammatory occlusion of the blood vessels. Segmental fibrinoid necrosis of a vessel wall and transmural inflammatory cell infiltration are the main pathologic features of vasculitis. Leukocytoclastic reaction traditionally has been considered the primary mechanism of vessel injury in these diseases, although more recent evidence suggests that cellular-mediated mechanisms may be more important in the peripheral nerve. Immune complexes are formed as a result of antibodies reacting with antigen found within the blood vessel walls. These immune complexes within the circulation activate the complement cascade, generating chemotactic factors responsible for recruitment of polymorphonuclear leukocytes at the local site of deposition of the complex. Degranulation of the polymorphonuclear leukocytes releases proteolytic enzymes, which, along with free radicals, disrupt cell membranes and damage blood vessels. T cell–mediated processes against epineurial and endoneurial vessels likely are also important in the pathogenesis of vasculitic neuropathies. Necrotizing vasculitis causes neuropathy through ischemic injury to the vessels supplying the nerve. Poor collateral circulation in the nerves makes them susceptible to ischemic injuries. Commonly involved nerves with these features tend to be in the mid upper arm and mid thigh in the "watershed zone." Vasculitic neuropathy most often presents as mononeuropathy multiplex (ie, in more than 60% of patients), with the peroneal nerve most commonly affected (89% of patients), followed by the sural nerve (84%), tibial nerve (68%), ulnar nerve (42%), and median nerve (26%). Distal symmetric polyneuropathy is the second most common presentation, seen in less than one third of patients. The nerves most often affected clinically are a diffuse mix of distal more than proximal lower limb nerves, arising either from the lumbosacral plexus or from widespread multifocal nerve involvement (ie, summation of existing patchy lesions). Cranial nerve involvement also has been reported in systemic vasculitis. Facial nerve neuropathy is observed most commonly, occasionally accompanied by abnormalities in cranial nerve III, VI, or X.
Relapse rates observed in systemic vasculitides range from 11-60%  when all manifestations are included (neurologic and systemic). Relapse occurred almost exclusively in patients treated with prednisolone alone. Aggressive early treatment with cyclophosphamide may prevent relapse. Peripheral nervous system involvement is an American College of Rheumatology (ACR) diagnostic criterion for polyarteritis nodosa and Churg-Strauss syndrome; it occurs in 50-78% of patients. [16, 17, 18, 19] The reported incidence of vasculitic peripheral neuropathy in primary vasculitides has varied from 20-80%  , reflecting the clinicopathological overlap between individual syndromes and associated nosological uncertainty. No controlled studies document mortality rate, but death generally is secondary to systemic complications of the vasculitis. Chance of recovery is better in nonsystemic vasculitic neuropathy, with good recovery for most patients. Studies have shown that morbidity and mortality rates tend to be very high if the condition is untreated and systemic or if the condition is misdiagnosed. In one study, final disability in those who survived more than 24 month was no sign or symptoms in 17%, mild-to-moderate disability in 65%, moderately severe disability in 13%, and severe disability in 4%. Chronic pain was persistent in more than 60% of patient in this study. One cohort study showed a 5-year survival rate of 87%. The racial distribution of vasculitic neuropathy is unknown. Both genders are represented equally. Mean age at presentation is 62 years.